At our dental office in Mill Creek, we’re often asked what certain technical dental terms mean, and we’re always happy to explain them. Which brings us to the topic of the day: Occlusion. What is occlusion? What are we looking at when we talk about it? Why does it matter? We’re glad you asked! Occlusion is a simply a fancy name to describe the relationship between the way your upper teeth connect with your lower teeth when you chew, bite, or clench down. More commonly, occlusion is explained as your bite. 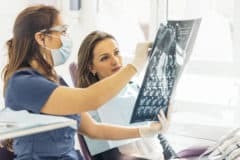 When your dentist in Mill Creek is evaluating your bite, he or she is looking for any areas where the two sets of teeth don’t line up well. A healthy bite is important for proper chewing, and if a bite is “bad,” the force placed on teeth isn’t distributed evenly. This can lead to several problems and the need for restorations or long-term treatment. There are times when people develop a bad bite as they lose their baby teeth and their permanent ones erupt. Most commonly, these are classified as overbites, underbites, or crossbites (more on these in a minute). Other individuals see a shift in their once good bite as they get older thanks to accidents, clenching or grinding, or as a result of teeth shifting when a permanent tooth is lost and not replaced. If you’re experiencing any of these signs, we encourage you to call our dental office in Mill Creek. Treatment to correct a bite varies from person to person, so it’s best to evaluate your individual situation and recommend a personalized plan.